Search Our Inventory / All Rugs / 10&apos; 7" x 13&apos; 6"
10&apos; 7" x 13&apos; 6"
With its virtuoso, incredibly detailed design, sumptuous regal color palette and consummate craftsmanship, this masterwork carpet exemplifies our emphasis on offering only the artistic highlights from the myriad antique Persian rugs available. 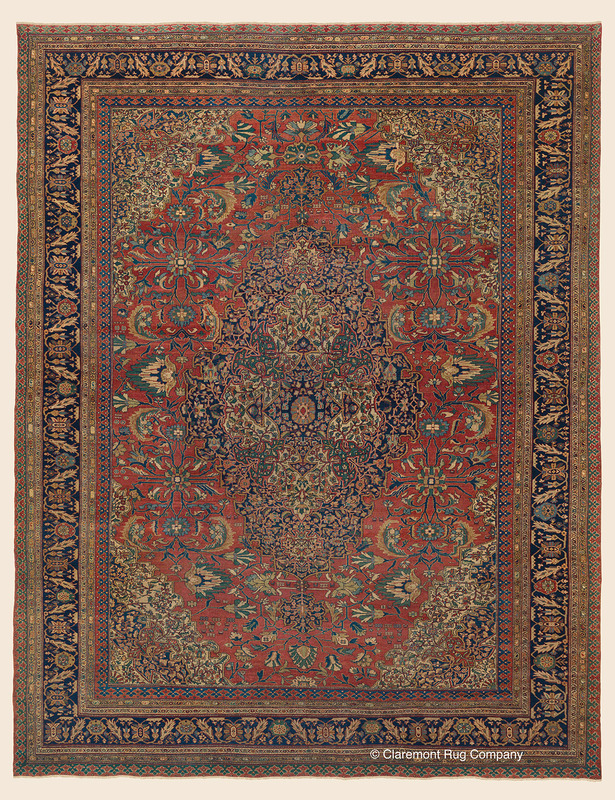 The staggering attention to detail and spirited formality of this antique rug reflects the greatest virtues of Ferahan Sarouk�s long respected stylistic tradition. Its astonishing, ornate centerpiece mirrored in the spandrels expertly contrasts with the larger scale, ornate and varied blossoms of the field. Clients with diverse architectural styles using contemporary grey tones to historical paneled walls find their rug of choice in this style�s aged rich coloration and ability to anchor and unify a space.